From the first day I had Pixel, when she was around 3 months old, I saw some unusual behaviors surrounding her tail nub. It took me a while to understand what she was dealing with, but once I got the connection, I studied her every move, action, behavior and response to things. Between studying Pixel's tail nub issues, doing extensive research on amputation and nerve pain, studying dog anatomy, and talking with veterinarians, I came up with a list of symptoms and behaviors to help pet parents identify if their dog is having dock tail issues or pain. 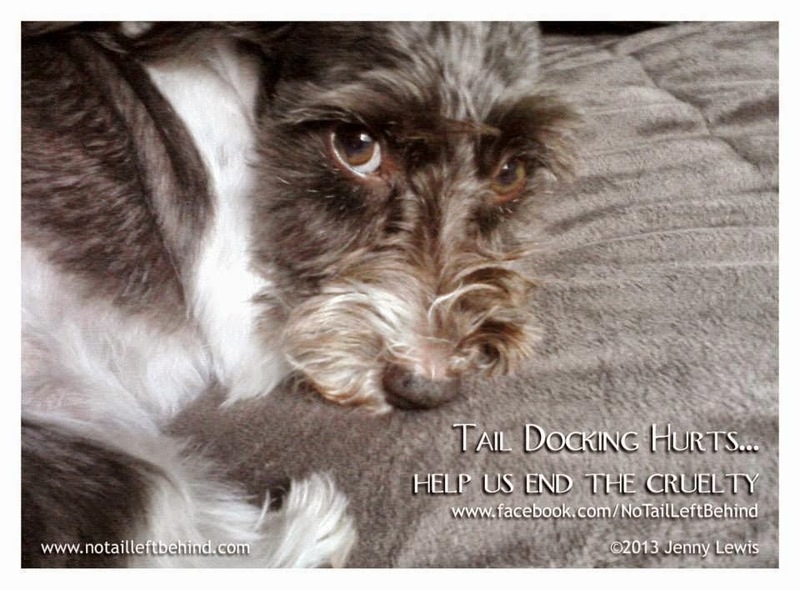 Since starting No Tail Left Behind in April, 2012, I have been contacted by hundreds of pet parents and rescue groups concerned about their docked tail dogs who exhibit symptoms and behaviors telling them that the dog is suffering in some form from their tail nub and surrounding area. The symptoms range in variety and severity. Some pet parents have said statements such as, "He doesn't seem to have any trouble with it, but he sure doesn't want anyone touching his tail nub because he snarls if you even brush up against it on accident." That's just one of many things I've been told by pet parents before they realized that their dog does have issues of pain or struggles with their tail nub. If you find yourself thinking or saying, "My dog doesn't have any pain from her docked tail but..." then there probably is a problem your dog is dealing with...alone. That's why No Tail Left Behind is here though, to help figure these things out so you as pet parents don't have to figure it out on your own. 1. Biting, licking, 'chasing' or whining at the tail or back end. They also might be overly sensitive about having a fellow dog sniff or touch their back end. 2. Hiding under a bed, in a corner or in a crate, if they have one, for long periods of time. 3. Isolation from the family or laying alone in a back room, often with a distant look on their face. 4. Refusing to come when called, even when they know the command well. They might even look straight at you as you call, just sitting in their bed, in the corner, etc, refusing to move. 5. 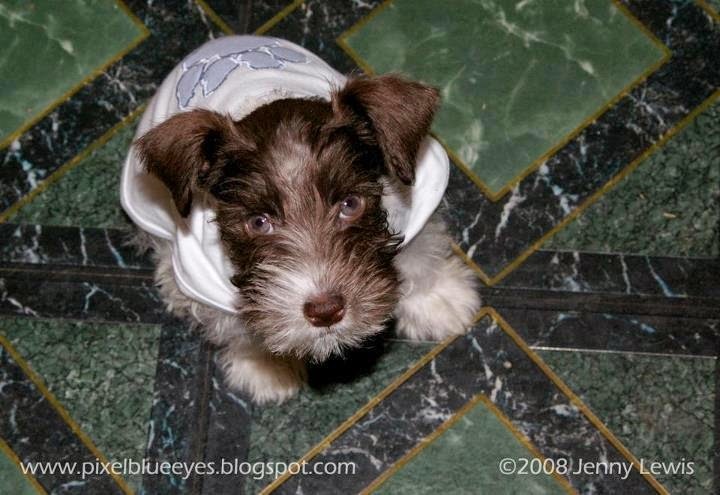 Difficulty potty training, either on indoor puppy pads or outside. It took Pixel several extra months to grasp potty training. 6. Difficulty having a normal bowel movement, including running away from a BM as it is occurring. 7. Incontinence, or unexplained potty accidents, even if they are fully potty trained. 8. Redness, inflammation, scaling or infections at the tail nub tip. Pixel is 6 years old and hers still gets red and inflamed at times. 9. 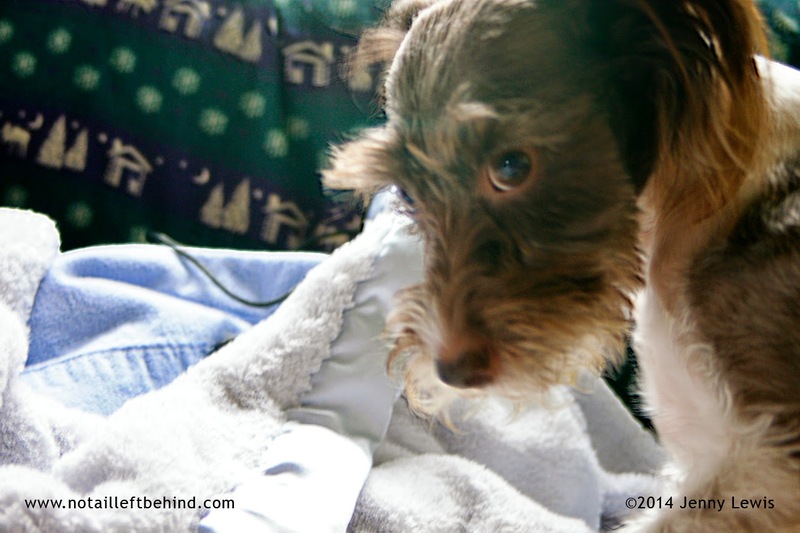 The dog acting like they are in trouble or are being punished, including crying out, yelping, or even nipping at someone who tries to pick up the dog, or touch the back end near the tail. 10. Getting excited over a loved one coming home or a fun play time, and then suddenly yelping and 'going after their tail'. Sometimes, when Pixel gets excited to see me, her tail gives her a fit. She can't even show how happy she is to see her Mommy without her tail stinging and hurting her. Excitement runs through the nerves in her tail nub as she wags with joy. This is certainly not the end-all list of signs and symptoms, but it is a good place to start. So watch your dock tail dog(s) closely, and if you start seeing any of these signs or other unusual behavior, even if it appears to be "acting out" behavior, keep notes, keep track, and talk to your vet. You can always contact us either here or on our No Tail Left Behind Facebook, Twitter or through email. No Tail Left Behind believes we must BE THE CHANGE FOR ANIMALS! ©2013-2016 No Tail Left Behind, Jenny Lewis & Pixel Blue Eyes. Awesome Inc. theme. Powered by Blogger.